I'm sure most of you already know about my love for FabFitFun and that I have been a #fabfitfunpartner for the past year but I genuinely can't sing this brand's praises enough! It is by far THE BEST way to discover new products and treat yourself without breaking the bank. One of the best parts? It covers all of my favorite product categories: fashion, beauty and lifestyle like fitness and home so you will have seasonal favorites that cover your needs from head to toe! If you're way late to game, the quick rundown on FabFitFun is that it's a seasonal subscription box that brings you full-size fashion, beauty, fitness and lifestyle products on a quarterly basis. With your subscription, FabFitFun will deliver new awesome products to your front door every single season. The value of their boxes is always over $200 and you get it all for only $40 using my discount code! Those are legit numbers, people. Crazy, right?! I don't know about you but I'm a sucker for an epic deal, especially as a mama-to-be! If I've already piqued your interest and you want to head straight to fabfitfun.com now, don't forget to use my special code SHENAEBLOG at checkout to receive $10 off of your Fall Box! 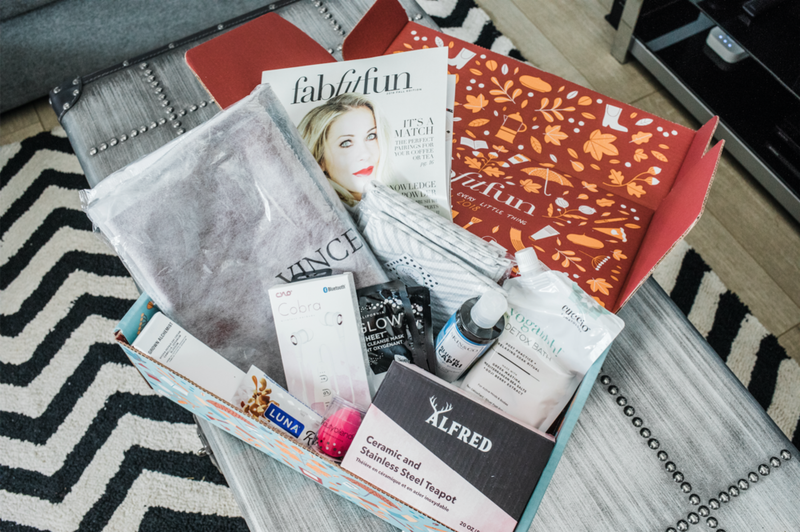 If you need a little more convincing or are just curious about what you're going to receive when you sign up then keep reading for my full sneak peek and review of the FabFitFun Fall Box 2018! One last fun fact about FabFitFun: You are now able to customize a handful of items in your box so you can choose from several rad products and still get surprised with a few, too! Get Your Fall Box Now! While I know technically this is one of the smaller ticket items in the box, it was also one that I was most excited about! I use a beauty blender every single day to apply makeup but these little guys cost a pretty penny for a bit of egg-shaped sponge so a majorly discounted one is a major score in my books! I've used several masks from GLAMGLOW but this is the first cleansing sheet mask I've ever tried and it was an interesting product to say the least. I suppose it provides a deeper clean than your typical cleanser otherwise I don't much see the point but I do love the novelty of trying different masks any which way so this is a fun product to receive anyway! This is a major ticket item and one that you have the option of choosing for your box. I love Vince Camuto and his products are always stylish, timeless and last well over time. This bag costs $128 retails so this alone is four times the value of the entire box if you use my code to buy your FabFitFun box! I am always losing headphones on and in between flights so the more the merrier in my life. These earbuds also happen to be wireless and connect to your device via bluetooth so they're cute and high tech. This is just too cute. As a pregnant gal and soon-to-be breastfeeding mama, my coffee intake has been cut way back so a good cup of tea has become a new friend and steeping it in this cherry blossom adorned pot just makes me smile. I know this is another smaller ticket item but again, this is one I was most excited about! I cook and entertain quite a bit and I feel like you have never have too many tea towels handy in the kitchen. The chevron print of these is so cute and modern and the white and grey coloring goes perfectly in my house! My bathtime appreciation has skyrocketed with this pregnancy and while I'm sticking to epsom salt baths at the moment, I can't wait to try these detox bath product out after my post-baby recovery is all said and done! This is a facial moisturizer that hydrates your skin without leaving it feeling oily or sticky (two of my pet peeves with face cream). While I try to stick to products I know and trust on my face, I can't help but love experimenting with new ones when they arrive at my door and I quite liked this one.